Ahmad Al Kamali has “emphatically denied” reports that he offered Rolex watches to fellow IAAF members ahead of the forthcoming IAAF elections. 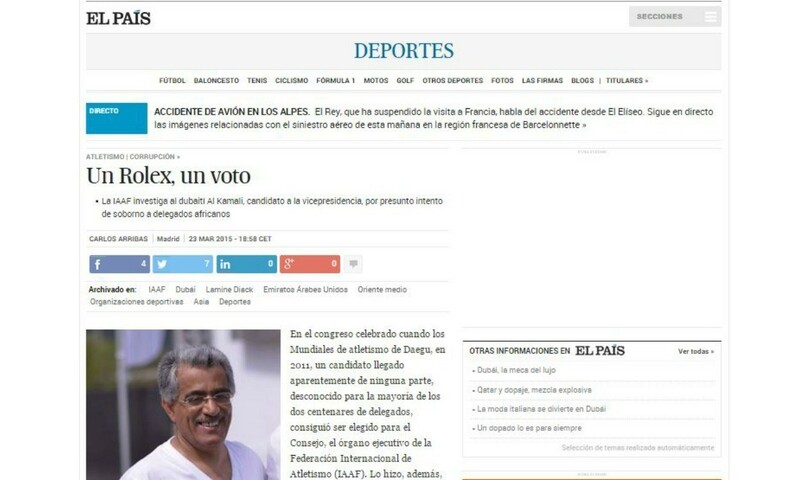 Spanish newspaper El País reported earlier this week that the UAE Athletics Federation president allegedly offered the watches to around 40 delegates who are entitled to vote in the IAAF elections later on this year at the African Athletics Congress in Addis Ababa held earlier this month. According to El País, the IAAF received a letter outlining the allegations and is investigating. But a statement by Al Kamali released on Thursday read in part: “Ahmad Al Kamali, IAAF Council Member and President of the UAE Athletics Federation emphatically denied news circulated by some foreign newspapers that he offered Rolex watches and other items as gifts in order to encourage people to vote for him in the IAAF forthcoming elections.